An address to the citizens by the Russian President via the Internet could be a key point in creating a completely new political system – the Internet democracy. Russian news web site Gazeta.ru on Thursday published an article written by President Dmitry Medvedev, in which the national leader not only shared his views on the country’s future and major problems, but also openly called for all readers to submit their suggestions and thoughts to him via email to the address given at the very beginning of the article. Medvedev wrote that he needed public feedback in order to prepare the annual address to the Federal Assembly – the document most political analysts see as the general development program for a year. This is not the first time the Russian president has surprised us with an unusual and modern way of communicating with the public. In April 2008, he started a blog, and at the beginning of this month, Medvedev’s video channel appeared on the Internet video service Youtube (interestingly, both Youtube and Livejournal, the blogging platform used by Medvedev, are US companies, even though Livejournal’s majority shareholder is a Russian firm). Medvedev’s blog was open for comments, and though it was obvious that the service is run by a group of people from the Presidential press service rather than the President alone, the comments were quite abundant, and most of them complaints on various problems in all of Russia’s regions – from high prices for swimming pool visits to suspected corruption schemes in tenders for state contracts – and Medvedev replied to many such comments with actual orders to his administration and the government. This time, the President openly asked the Russian people to think not of themselves, but of the fate of the nation as a whole. The article outlined the major threats Russia is still facing, such as a resource-focused economy, widespread corruption and, most interestingly in the context of the article, what Medvedev calls “paternalistic moods” – a lack of public initiative both in political and business life, and the tendency to rely completely on the authorities. 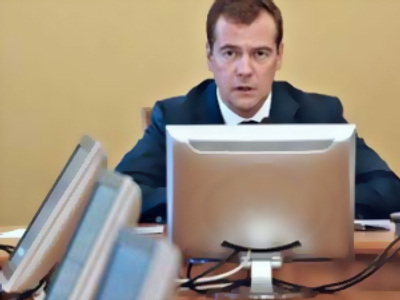 While the article also contained a set of calls to eliminate the drawbacks and move together towards prosperity – typical of any public address of a national leader – it is important that the third challenge mentioned by Medvedev could be tackled by any Russian citizen who was reading the article immediately after he or she has been through it (or even before that). 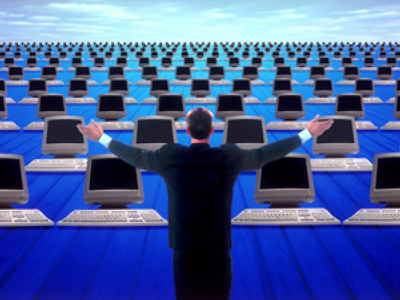 The article first appeared on the Internet, and the e-mail for the public feedback was given right at the beginning. This move could be an indication of why the Russian authorities attribute so much attention to modern communication technology, and especially the Internet. 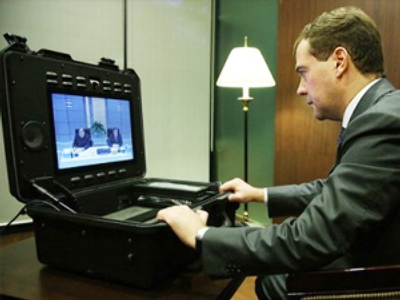 Of course, there is a human factor here – Medvedev is obviously very fond of technology and gadgets (it is an old story already that the President was photographed with an iPhone months before Apple started officially importing them to Russia), but it could also be a part of strategy to build Russia’s own democracy. The thing is, Russian authorities are now facing a paradox they had themselves: trying to build a society that would be at the same time democratic and manageable and also resistant to manipulations, especially from abroad. While the first step of the program – creating a powerful parliamentary majority – was very successful, and the openly pro-Kremlin United Russia now dominates the parliament, creating a strong opposition party proved to be a tougher task. The phenomenon of grassroots politics in Russia is almost non-existent. This is caused by the Soviet legacy, weak trade unions, the poor material state of the majority of the population and many reasons which I would prefer not to study here. The ways the authorities have tried to deal with the problem are more interesting. The Kremlin has attempted to create an opposition party at least twice. The first attempt was Fair Russia (Spravedlivaya Rossiya), followed by Right Cause (Pravoye Delo). Both declared their major objective as criticism of the ruling United Russia, but at the same time never criticized the general Kremlin course, and supported the President. Thus, the artificial opposition lacked real drive – its leaders understood that their activities were limited and real political competition was out of the question. It would be fair to note here that the so-called liberal opposition, who were much more critical of the Kremlin and who actually called for changes in society, lost all the most recent elections completely, and the once-popular Communist Party is now a parliamentary minority, as most former supporters proved to be seeking strong social policies, provided by United Russia, and not actual Communism. 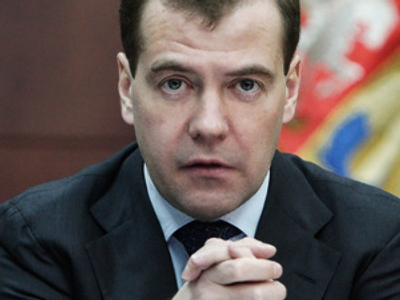 Medvedev’s experiments on the Internet could be a different approach to the problem. This could be the first time in modern history when a powerful centralized state is actually democratic – with direct participation of all active citizens rather than them delegating their political power to all sorts of elected officials. What may appear is a sort of all-Russian assembly with the President at its head. As with any system, this one can have both merits and flaws. Definitely, Russia’s population of 140 million would require a very large team of specialists to process all statements. The system must be very well built to withstand possible abuse and rigging. Citizens who are not so tech-savvy, especially elderly people, might feel that their rights are being infringed upon. On the other hand, the number of bureaucrats necessary to maintain traditional democratic institutes is also enormous, traditional voting systems are also prone to glitches (as demonstrated by the 2000 presidential poll in Florida), and the necessity to master certain skills in order to take part in the political life of one’s nation can be seen as proof that the intentions are serious. Besides this, democracy through the internet could give additional impetus to the major objective mentioned in Thursday’s article – the development of modern technology and gradual shift from an economy built on exports of mineral resources and energy. "Together we form a common spiritual space"